Veggie Box participants can arrange to pick up their boxes through participating worksites or at public pickup sites in convenient locations, year-round, throughout Rhode Island. Choose your pickup site when placing your order or contact us to change your pickup site. If you are interested in making your worksite, community center, school, or gym a new Veggie Box site, follow the steps below to get set up! Because delivery times vary from week to week, you may want to contact your site coordinator to see if your Veggie Boxes have arrived before you go to pick up your box. If Veggie Box sounds like a good fit for your site, determine who could be your site coordinator. This person will serve as our main point of contact and will recruit participants, relay delivery information, create a pickup system for your participants, and donate/distribute any boxes not picked up. Are there enough people interested in Veggie Boxes at your potential site? Looking for a convenient way to access delicious food from local farms? 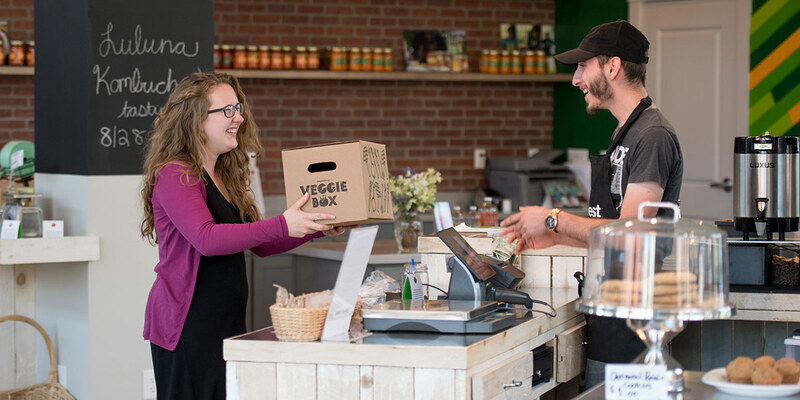 Veggie Box is a curated box of fresh food from RI and MA farms. Each box contains 7–9 different types of seasonal produce, and sometimes value-added products too! Along with each box, participants receive an email newsletter packed with recipes and information. Veggie Box is available on a weekly or biweekly basis. Boxes cost $28/week, and payment is made in full for one month at a time. There is a $6 annual fee. Farm Fresh RI accepts most credit cards and SNAP/EBT for Veggie Box payment. There is a minimum number of participants required for each site. This minimum is based on location and usually ranges from 6 to 20 people. Complete the form below and we’ll let you know what the participant minimum and delivery day (Tuesday or Wednesday) would be for your site. Once you have the required minimum number of people interested in enrolling, fill out this form and we can set your site up in our ordering software. As soon as your site is registered, we will send you a seasonal flyer and brochure customized for your site. Participants at your site will create customer profiles and sign up for the program through our website, which uses a secure credit card processing platform. We'll keep tabs on registrations for your site, and let you know when enough participants have registered to begin delivery.